I love to make a tart. They are always a brilliant addition to a barbecue spread or picnic and very useful for a quick alfresco (or aldesko) lunch. This tart is bursting with flavour and is wonderfully fresh whilst being incredibly satisfying. The trick here is to squeeze out as much of the water from the courgettes as you can. This allows them to brown nicely giving it a delicious slightly charred flavour. You will need a 23cm fluted tart tin to make one 23cm tart. Preheat your oven to 200ºC fan. Place your grated courgettes in a sieve balanced over a bowl. Add a good pinch of salt and toss them well. Allow them to sit for about ten minutes before squeezing out as much of the water as you can. Heat about 2 tablespoons of olive oil in a pan and add your onions. Let them sweat on a medium heat for about 3 minutes before adding your garlic. Cook for a further 2 minutes. Add your squeezed courgettes and continue to fry for about 7-10 mins until your courgettes have begun to brown in places. Transfer them to a plate and spread them out allowing them to cool quickly. Lightly grease your tart tin before rolling out your filo pastry. Using a pastry brush paint one sheet with oil. Lay it in the tart tin leaving a pastry overhang of about 1 inch. Repeat with the remaining pastry covering the entirety of the tin and creating even edges. Crimp the edges down, working your way around the tin to create a scrunched boarder. Brush with more olive oil. Prick the base and bake for 10 minutes. After 10 minutes remover the tart briefly. Push down the centre and brush it all over with beaten egg. Bake for a further 5 minutes. Remove from the oven and reduce your temperature to 180 ºC. Transfer your courgettes to a medium sized bowl. Add your peas, eggs, herbs, lemon zest a good pinch of salt and grid of pepper and whisk with a fork to combine. 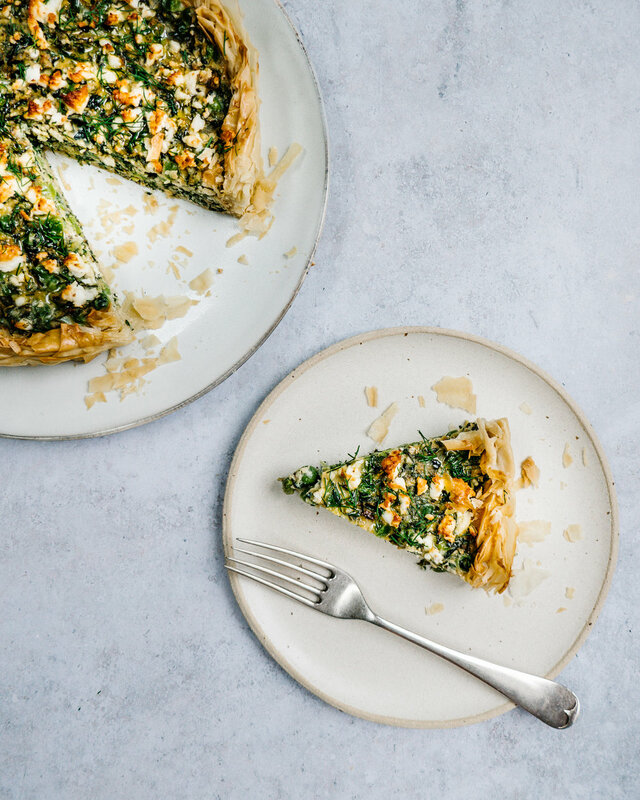 Crumble in half your feta and pour into your tart shell. Crumble over the remaining feta and bake for 40 minutes until set. Enjoy warm or at room temperature. Store in the fridge. This tart reheats very well. Just reheat it for about 15 minutes in an oven set to 180 ºC. Copyrights © 2017 All Right Reserved by Alexandra Dudley LTD.